With its detailed miniatures and comprehensive, intuitive ruleset, Star Wars™: Legion offers you the chance to imagine the infantry battles of the Star Wars galaxy—wherever you and your friends might fight them! You can fight atop the shifting dunes of a desert planet, battle before the entrance to one of the galaxy's abandoned mining facilities, or crash through the forests of a mission-critical moon. The rules for terrain beg you to take your battles to a wide array of battlefields, and it's easy to envision how the changing battlefields might shape the composition of your army or the objectives you'll fight for. After all, the Star Wars galaxy is a vast place—full of conflict and adventure. And it's all yours to explore with Star Wars: Legion. To help you explore more Star Wars battlefields and enjoy more of Star Wars infantry battles, you have Star Wars: Legion Organized Play. 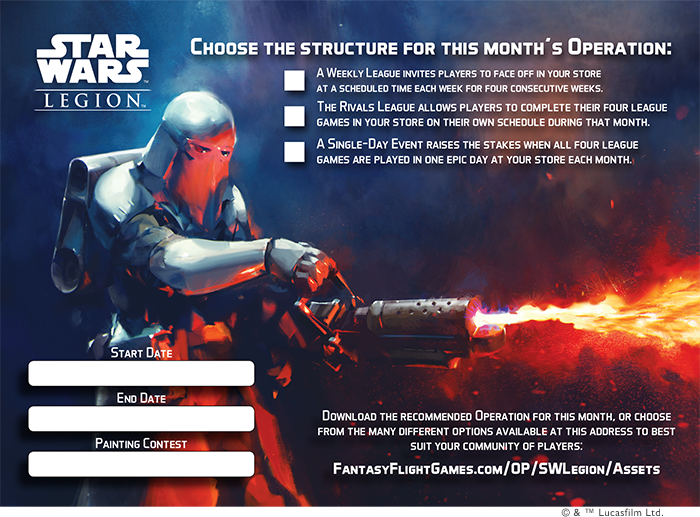 Its far-ranging scope covers everything from special one-time events like the In-Store Demos and Launch Weekend to a competitive track that culminates with the World Championships, but the heart of Star Wars: Legion Organized Play lies at the local level—with your favorite local game store and the seasonal Ground Assault Kits! Building upon the model established by the recently announced Recruitment Kit, each Ground Assault Kit comes with materials to support a group of up to eight players for three months of in-store play. Each month, you'll be able to enjoy a new style of play as each Ground Assault Kit supports three different operations. Before the release of each new Ground Assault Kit, you'll find new operations posted online. As the game grows and more Ground Assault Kits are released, these operations will remain online, meaning that your local playgroup will have tremendous flexibility to play the newly recommended operations or replay past favorites. With the 2018 Season Two Ground Assault Kit, you'll be challenged to seize control of a vital battlefield in Operation: Take the Hill. You'll march to battle with ever-larger armies in Operation: Massing Superiority, an operation that easily translates into a thrilling tournament experience. And, finally, you'll enjoy the thematic experiences of Operation: Blue Metal, an operation in which each game has consequences that play out in subsequent games as opposing armies vie for control of an old metal mining facility on a frozen planet. Alternatively, your store could swap one of these operations for one of the operations from the Recruitment Kit. Because we will keep these operations archived online, each new Ground Assault Kit introduces additional freedom for your community. Aim for the experiences that best reward your community. Even as they afford your local community the opportunity to choose from a growing range of operations, Ground Assault Kits come with guidelines for three different league structures, each of which covers one month of in-store events. A Weekly League allows you to match up against other players at a pre-scheduled time each week for four weeks. A Rivals League allows you to pair against a single rival for all four league games, scheduling those games for whenever you can play them in the host store. A Single-Day Event features an entire league in a single, epic day of in-store Star Wars infantry battles. It's worth noting that this flexibility doesn't just make it easier for your local community to get together—it also lets you change the tenor of your battles. Play through the four stages of an operation over the course of a relaxed Weekly League, and you'll have plenty of time to tinker with your forces between each new assault. But you won't necessarily know who you're going to face. However, that changes in a Rivals League, in which each game after the first offers you a new chance to outguess your rival. And, of course, a Single-Day Event can play out like a competitive tournament, or it can simply serve as a fantastic bonding experience for your local community—gaming, laughter, revelry, competition, and excitement. As any veteran gamer knows, the nature of an event changes as players relax over the course of full day of gaming. By the end of the day, it's often less about the competition on the table than the camaraderie over it. After you play through a few of the battles supported by a Star Wars: Legion Ground Assault Kit, you'll no longer be a raw recruit. You'll be a battle-tested veteran. You might even be a decorated war hero. Like the Recruitment Kit, each Ground Assault Kit comes with an array of prizes to be distributed with each new operation, and these are awarded when you first participate in the league, after you've completed three of your league games, and at random—although you can increase your chances by achieving more of the operation's various objectives. For example, the 2018 Season Two Ground Assault Kit supports your first operation with seventeen extended art copies of the Ambush command card in Aurebesh, as well as thirteen copies of a custom Aim token. One copy of each of these prizes is the tournament organizer's to keep or to hand out at his or her discretion. You'll get one copy of the extended art, Aurebesh Ambush command card after you play your first league game. You'll get one of the acrylic Aim tokens after you finish your third league game. Eight of the extended art Ambush cards are patronage cards for your local game store to hand out to people who purchase Star Wars: Legion products. The Aim tokens that weren't distributed to players based on participation are distributed in a semi-random fashion. Players check the boxes on the league's Achievements tracker by participating and scoring specific goals. Checked boxes are selected at random for additional tokens, so the more you play, and the more you focus on your achievements, the better your chances of claiming multiple tokens. Each month's operation is accompanied by a new assortment of cards and tokens. Over the course of your second operation, you'll have a chance to earn a custom Dodge token and an extended art, Aurebesh version of the Push command card. The third operation affords you a chance at one or more Suppression tokens, and an extended art, Aurebesh version of the Assault command card. In the end, Star Wars: Legion Ground Assault Kits don't just provide you new ways to enjoy your Star Wars infantry battles—they also reward you for your successes. You can collect decorative cards and tokens to demonstrate your rank and prestige and, perhaps, even use them to inspire your troops! 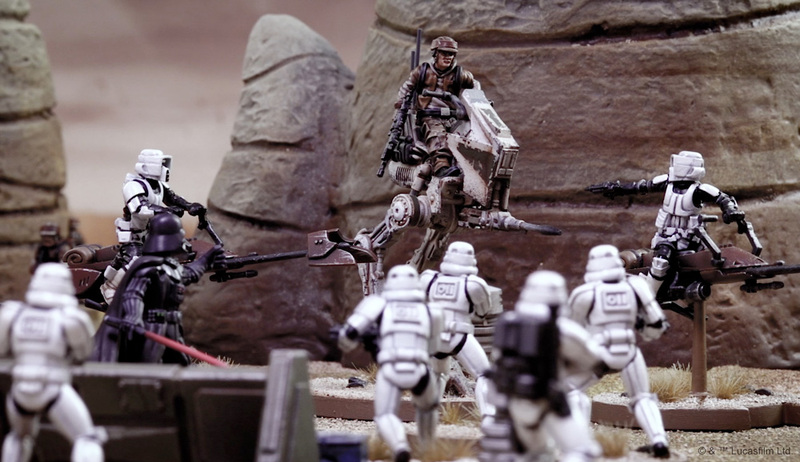 As much as it is a game of thrilling infantry battles—one that pulses with laser fire and hums with the sound of ignited lightsabers—Star Wars: Legion is also a game that begs you to explore all the creative possibilities of hobby miniatures. 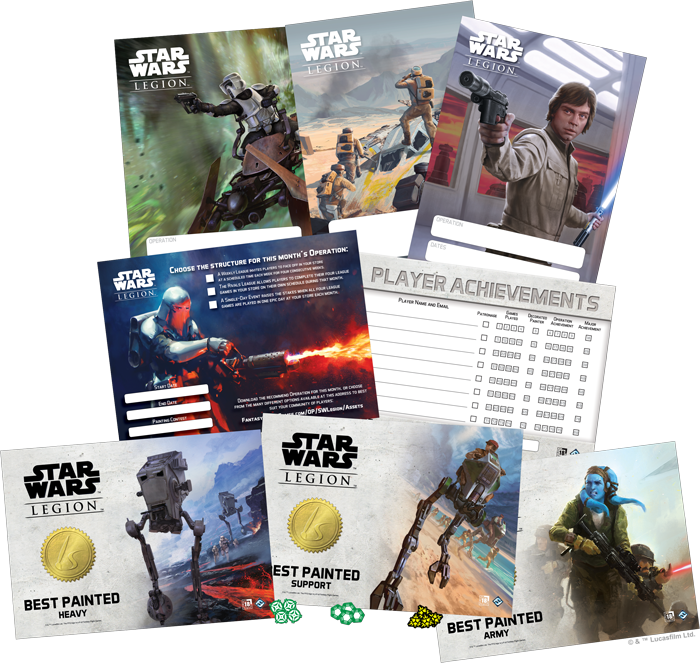 Star Wars: Legion rewards you for all the time you invest in everything from painting your miniatures to carefully sculpting and designing the terrain on which you wage your battles. When you do, the game doesn't just represent the Star Wars galaxy and its infantry battles in some abstract fashion, it brings them to life in an explosion of color, detailed sculpts, and action! 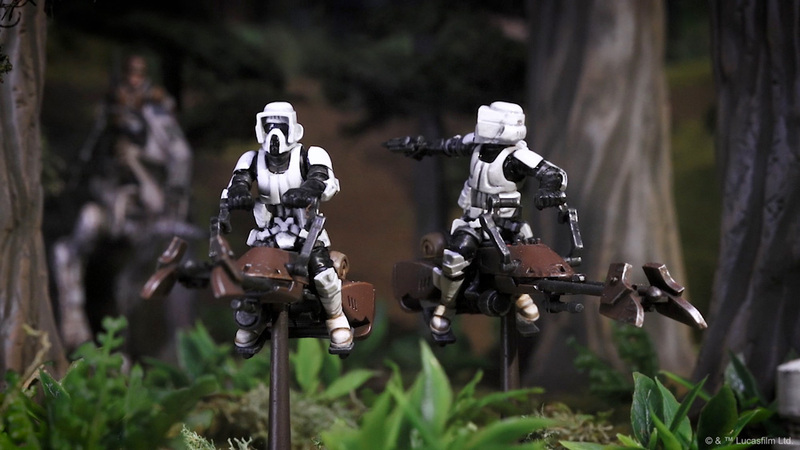 Accordingly, each Ground Assault Kit celebrates the hobby aspect of Star Wars: Legion with materials to support three painting contests, each of which focuses on a different type of unit. In the 2018 Season Two Ground Assault Kit, you'll find prize certificates to be awarded for the best painted Support unit, Heavy unit, and complete Army. The 2018 Season Two Ground Assault Kit comes with materials to support three months of in-store play. The Star Wars galaxy numbers countless planets, and with Star Wars: Legion, you can imagine the battles of the Galactic Civil War playing out on pretty much any of them. The Core Set gets you started. Unit Expansions add extra dimensions and possibilities. And the support of Star Wars: Legion Organized Play ensures you'll find plenty of new opponents waiting to face you and your forces on these countless battlefields. More battlefields. More battles. That's the mission of Star Wars: Legion Organized Play, and it takes shape in your community with the forthcoming Ground Assault Kits. Talk to your favorite local game store about participating today!